Are your HR professionals doing the job they were hired to do? The fundamental mission of any human resources department is to find and recruit the best talent, help motivate those employees to top performance, and maintain an organizational culture of high morale and high accomplishment. But that is difficult to do if your professional staff are spending more time performing administrative tasks than they do working in activities that bring value to your organization. In today’s digital age, it simply no longer makes sense to have highly skilled professional staff burdened with antiquated paper-bound workflow and systems. Organizations from all industries are taking a fresh look at the advantages of document automation for Human Resources. According to a recent “Winning the Paper Wars” study conducted by AIIM, The Global Community of Information Professionals, 68% of companies feel that business-at-the-speed-of-paper will be “unacceptable in just a few years’ time.” And, 46% consider that the biggest single productivity improvement across the board for most of their business processes is to remove the paper. Despite the increasing digitization of business today, the truth is that most Human Resources departments are still buried in paper. According to the AIIM report, paper flowing through common business processes like human resources is actually increasing for 25% of organizations. Most HR professionals will tell you that their world is one that is awash in printouts and paper, e-mail messages and file attachments, faxes and scanned documents, and a variety of online systems and forms that can be a nightmare to manage. The result is that HR professionals often spend more time, effort and money performing administrative duties than they do attracting, hiring and maximizing the human capital of the organization. In recent years many key business functions have been successfully automated with enterprise content and document management tools. Core activities like accounts payable or claims processing are just two common examples. Now, organizations are beginning to focus their automation efforts on the Human Resources function. The goal is not to eliminate headcount but to instead empower professional staff and knowledge workers to transform HR from a cost center to a value center. This is done by automating the processes with modern document and content management tools, and by enabling more integrated data and case management capabilities that are simply not possible using the paper-bound workflow of the past. The return on investment is powerful for organizations that are tapped into the opportunity. Sixty percent of organizations participating in the AIIM study reported capturing an ROI on their paper-free projects within 12 months, and an impressive 77% within 18 months. Improved searchability and sharability of important documents is the biggest driver, as well as improved process productivity and reduced physical storage space. It’s easy to see how all of these factors quickly come into play when considering the typical HR operating process and office environment. Managing the human capital of an enterprise requires a staggering amount of documentation that starts even before an employee is hired and continues well after a person has left the company. New hires cause a variety of forms and documents for background checks, state and federal taxes, health insurance, non-disclosure agreements, and more. During employment, any number of events generate even more paperwork for things like workplace claims, training and certifications, employee performance reviews and annual benefits reenrollment—to name just a few. Employee retirement and turnover generate yet additional forms, documents and information that all must be secured and retained for years after termination. Each one of these routine documents takes valuable time to process. Studies show that a simple resume takes over a minute to onboard, while other standard documents like a W2 form, I-9 or a job application can take two or three minutes to handle. The bigger the company the bigger the burden. By automating these common HR documents, departments find that they save significant time, money and effort, and boost the productivity of HR staff and professional resources. In the past some executives regarded HR as strictly a cost center and not value center. But as organizations come to realize that people are one of their most important (and often most expensive) resources, that value proposition is beginning to quickly change. In today’s competitive business environment it makes sense for organizations to invest in technologies and methodologies that will remove undue administrative burden and empower HR professionals to concentrate on finding the best talent and fostering the best environment for organizational success. But it takes the right tools and time in order to focus on these more strategically valuable activities. 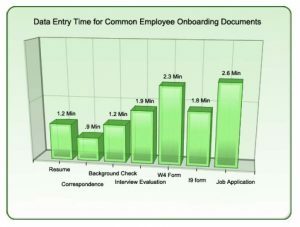 One example of how HR departments can improve productivity with document automation is the employee onboarding process. When a new employee is hired, the process involves a number of important documents; tax forms, benefit enrollments and employment offer letters are common, as well as any number of additional documents including non-compete and non-disclosure agreements, employment eligibility forms and background checks. It is not uncommon for a new employee file to grow to include 20 documents or more. One study performed by Provoke Research Partners found that a typical onboarding document requires an average of 1.7 minutes or more to process. The result is over 30 minutes of data entry per employee. Nearly half of all organizations surveyed for AIIM’s “Winning the Paper Wars” report indicate that keying data and searching for documents is the most pressing issue caused by paper-based processes. Storing and retrieving HR documents is another area where savings and improvements can be captured with document automation. According to the Gartner Group, paper documents claim up to 60 percent of office worker’s time and account for up to 45 percent of labor costs. In another study by Prism International, they found that an average of seven percent of documents are misfiled, resulting in handling costs of $120 per document. HR departments that automate the onboarding process begin to see immediate labor savings while allowing the department to concentrate on more high-value activities associated with employee onboarding like recruitment, talent acquisition and training. Employee onboarding is just one example. Magnify the productivity gains and savings to include common events and processes like annual re-enrollment in insurance plans and the compounding return on investment and process improvement from HR document automation becomes clear. Document automation in HR is also important because of the varied and demanding retention requirements for human resources documents. Scores of different regulations and standards dictate which records must be kept and for how long. The Civil Rights Act, the Fair Labor Standards Act, and the Age Discrimination in Employment Act are just three examples of overarching regulations in the U.S.
Further standards set by regulatory bodies like the Securities and Exchange Commission, the Occupational Safety and Health Administration, or the Equal Employment Opportunity Commission are other examples of the many additional and varied HR retention requirements. Even when no specific retention requirements exist, most HR departments choose to err on the side of caution and keep duplicate and redundant copies—often printed out on paper—to ensure that the organization could withstand regulatory and legal scrutiny if needed. More and more organizations find that keeping up with retention requirements is difficult to do with traditional approaches to document management. Automating HR provides a right-sized gateway into larger enterprise content management repositories while providing the many improvements and efficiencies of a digital workflow that HR departments need. If you thought that document automation for HR would be too costly and too complex, it’s time to think again. Once the purview of only the largest enterprises, a new generation of document and content management systems are now available that have been designed from the ground up with Human Resources in mind. These next-generation solutions combine the power of document and data capture with process automation and case management capabilities that really make a difference…and don’t require enterprise-sized budgets and support teams. How does it work? Document images are captured from any copier, scanner, e-mail or fax. Important data elements—names, numbers and amounts—are all automatically extracted as well. This information is uploaded seamlessly and a common interface provides access to everything associated with that employee file. No more manual data entry, no more multiple copies, no more redundant paper files. The automated and seamless integration removes the burden of paper from the HR process and saves time and money through improved workflow. HR departments can now leverage the same power and efficiencies of document and data capture that other core enterprise functions have been leveraging for years. HR document automation is an important strategic imperative, but how do you know which tools and solutions are best? Leverage the industry trend toward more affordable, less complex solutions designed specifically for HR. Look for advanced capture capabilities that use common input devices and can easily integrate into your existing workflow. Include intuitive and comprehensive search and retrieval functions, and capabilities that allow you to automate repetitive, mundane and time-consuming tasks. Look for solutions and partners that provide the right mix of experience, vision, and advanced capabilities that will help you capture the full value of HR automation. Watch our 6 Minute Tour, then contact our sales team to setup your personal demonstration.